Ah, peanut butter and chocolate – such a reliable combination. Not only do these cookies employ the notoriously beloved duo, but they take it up a notch with a dollop of creamy, almost-too-decadent fudge and a hearty dose of oats. 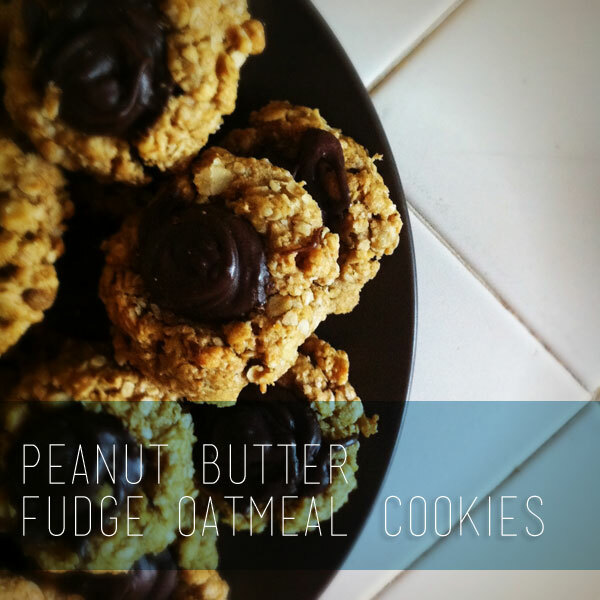 The oats make a moist and chewy cookie and set the perfect background for the fudge to take center stage. If you want to get people to like you, bake these cookies for them. That is, unless they have a peanut allergy – these guys do have quite the (deliciously) lethal dose of PB. I made these a few weeks ago on a baking binge, and the people are still reminding me of their success! A super easy recipe and one definitely worth trying (and subsequently inhaling). Bakers enjoy, eaters rejoice! In a large bowl, mix the butter, peanut butter, and sugars. (You can use beaters, but it’s easiest to just vigorously mix by hand.) Mix in eggs and vanilla until thoroughly incorporated. Add the oats, baking soda, and salt, and mix thoroughly. Refrigerate the dough while preparing the fudge topping.